Great for pressing the juice from soft fruits (pitted peaches, apricots, etc.) 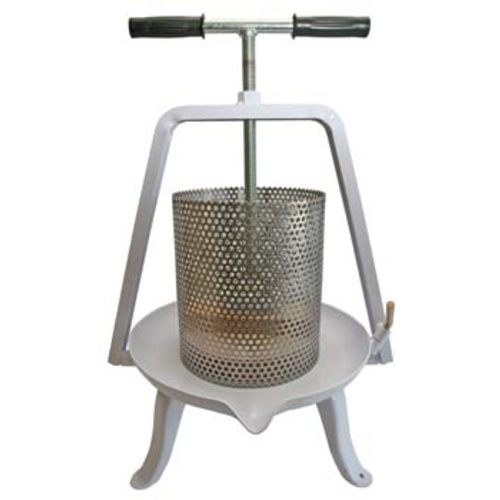 or when used in conjunction with our manual apple crusher to make cider. The basket is made from perforated stainless steel. The press mechanism is a single plate that pushes down via a threaded shaft that is connected to a t-handle. The entire pressing mechanism is hinged and folds out of the way when done, allowing for easy removal of spent fruit solids. Much faster than a typical wine press. 20 cm Diameter basket holds 9.5L (2.5 Gallons) at a time. Does not include any straining bag, though one can be added to reduce product bypass. See our BAG26.